The S&P 500 Index fell 0.1 percent to 1,979.21 at 10 a.m. in New York, trimming an earlier drop of 0.4 percent. (Bloomberg) – U.S. stocks fluctuated, after the Dow Jones Industrial Average closed at a record yesterday, as rallies in Microsoft Corp. and UnitedHealth Group Inc. offset sanctions against Russia and a slump in housing starts. Microsoft gained 3 percent after saying it will eliminate as many as 18,000 jobs, the largest round of cuts in its history. UnitedHealth jumped 2.2 percent as earnings topped forecasts. SanDisk Corp. dropped 11 percent after posting profit margins and sales forecasts that fell short of some analysts’ estimates. The Standard & Poor’s 500 Index fell 0.1 percent to 1,979.21 at 10 a.m. in New York, trimming an earlier drop of 0.4 percent. The Dow slipped 3.76 points, or less than 0.1 percent, to 17,134.44. Trading in S&P 500 companies was 27 percent above the 30-day average for this time of day. The S&P 500 has rallied 7 percent this year amid better- than-estimated corporate earnings and central bank stimulus. The U.S. economy is showing signs of recovering from a 2.9 percent contraction in the first quarter. The benchmark index increased 0.4 percent yesterday as companies from Time Warner Inc. to Intel Corp. rallied amid deals and better-than-forecast earnings. A total of 24 companies on the S&P 500 report earnings today, including Google Inc. and Schlumberger Ltd. Profit by the gauge’s members increased 4.5 percent in the second quarter, and revenue rose 3.1 percent, according to analysts’ estimates compiled by Bloomberg. Beginning home construction unexpectedly declined in June to a nine-month low as a record plunge in the South swamped gains in the rest of the U.S. Housing starts fell 9.3 percent to an 893,000 annualized rate from a 985,000 pace in May that was weaker than initially estimated, figures from the Commerce Department showed. The median estimate of 79 economists surveyed by Bloomberg called for a 1.02 million rate. The Federal Reserve Bank of Philadelphia’s factory index increased to 23.9 in July, another report today showed. Readings greater than zero signal growth in the area covering eastern Pennsylvania, southern New Jersey and Delaware. Fed Chair Janet Yellen said this week that “significant slack” remains in labor markets and inflation is still below the Fed’s goal, indicating that the central bank must press on with monetary stimulus. She said yesterday that asset valuations in general aren’t out of line with historical norms, after a central bank report earlier in the week indicated prices for smaller social-media and biotechnology companies are substantially stretched. With the Dow at a record and the S&P 500 close to an all- time high reached this month, financial professionals are growing more anxious. 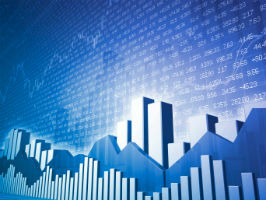 Forty-seven percent of investors, analysts and traders in a Bloomberg Global Poll said the equity market is close to unsustainable levels, while 14 percent already see a bubble. Most respondents said stock swings will increase within six months, the July 15-16 poll showed. –With assistance from Jonathan Morgan in Frankfurt and Callie Bost in New York.